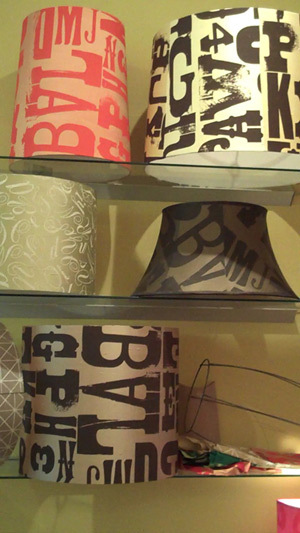 Lampshades are not usually something you think of when designing green, and it is really hard to find environmentally friendly shades. Most shades have a plastic styrene backing which in no way is biodegradable. They are then coated with toxic glue then the fabric. Let’s think what happens when this glue gets hot,….toxic glue….hot light bulb….your baby’s room….hum? None too good for the earth, and on the aesthetic side- most plastic based shades are ugly, thus none too good for your decor. 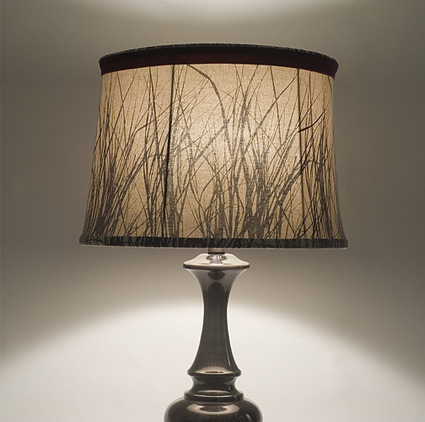 LiT, a not only local but green designer lampshade company (based in Seattle, Washington), is taking a stand against ugly toxic shades by making their shades earth friendly through careful consideration in the materials used in producing LiTshades. Instead of plastic owner Dawn Bassett uses only paper backing. The backing is laminated using water based, non-toxic adhesive and then the reclaimed, recycled or re-purposed fabrics and papers give the shades their final touch. She also insists on only using natural fiber textiles like silks and cottons. Dawn makes all her shades by hand, usually sitting quietly or rocking out to the Yeah Yeah Yeahs in her shop. Her shades are not mass produced in Vietnam, Indonesia, or China in large crazy factories by little kids for two cents a day. With this earth friendly piece of mind you can now rock your lucky little one to sleep under the soft light of a LiT shade and know that the decision you made to buy a LiT shade was one that was good for you as a mom, and Mother Earth. Today’s guest blog post is brought to us by Britt Bertolucci Cao, who writes for LiT Shades blog Get LiT and Statements Tile blog Ciao Tile.